Raising a disabled child can be physically, emotionally, and financially challenging. Many families find themselves struggling to maintain financial stability due to the medical expenses and lost earnings that are often associated with special-needs children. Fortunately, to help parents and caregivers living in this complicated situation, the Social Security Administration offers financial assistance to disabled children in need. If you are facing financial difficulties due to caring for a disabled child, he or she may be entitled to supplemental security income, or SSI, through the Social Security Administration. To learn more about the application process for these child disability benefits, contact a compassionate Indianapolis child SSI benefits attorney from the Hankey Law Office, P.C., today at 317-634-8565.
Who is Eligible for Children’s SSI Disability Benefits? It typically takes several months for a request of disability benefits to be filed, and then it can take additional time for payments to be issued. However, some conditions are considered so severe that children who are diagnosed with them can begin receiving payments right away, even while the SSA is still in the process of determining their long-term eligibility. The medical expenses associated with these conditions are often high, making SSI benefits essential to your child’s health and well-being. The many steps and requirements for SSI applications can make filing for children’s disability benefits a confusing and frustrating experience. 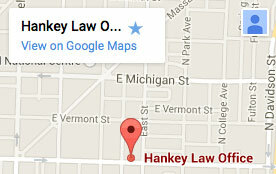 However, a dedicated Indianapolis child SSI benefits lawyer of the Hankey Law Office, P.C., can give you the insightful legal advice and guidance you need during this difficult time. To discuss your case, contact our offices at 317-634-8565 today.